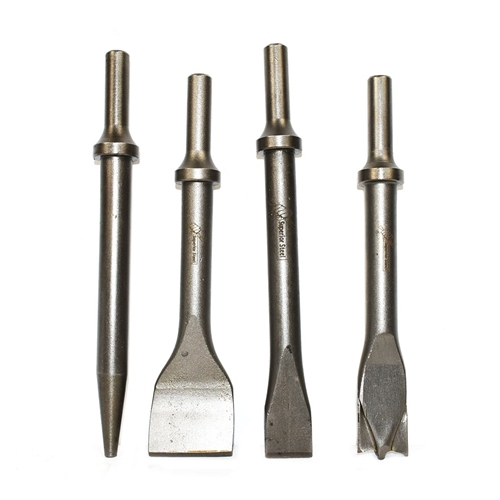 Superior Steel SC774C Chisel Set Round Shank Collar Round 4 Pieces Set. Steel Chisel Rotary Hammer Drill Bit set to chisel brick and concrete when laying cable. Designed for use with most SDS-max® hammers. A full assortment of hammer steel points and chisels. We brings innovation to concrete and masonry drilling with increased efficiency and higher durability. Add versatility to your rotary hammer with a wide variety of specialty bits. Digs clay, hard-packed gravel and dirt Fully hardened steel body avoids breakage and delivers increases life and durability. Hardened steel design stands up to the toughest daily use. For concrete removal, hard surface break up and chieseling.For light chipping and chiseling of tile, mortar, glazing compounds, and other masonry products. The set includes a Punch, Double Edge Chisels, Flat Chisels and a Scraper. Punches have been machined to exacting tolerances for accurate driving without damaging the pin or hole. Made of hardened tool steel with a knurled body. 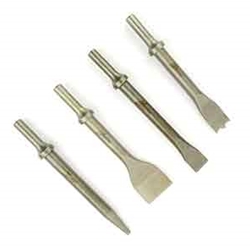 The Double Edge Chisel can be used for fast clean edge panel cutter mill edged not just forged. The flat chisel is for use via SDS-plus chisel attachment of direct in SDS-plus hammers with rotation stop. General purpose chipping, edging and channeling, for light rotary and demolition hammers. Flat-spade design creates "self-sharpening" edge eliminating downtime and increasing removal rate. It deliver the best solution even in the most difficult applications. Optimized length for improved handling in tight space. And the Scraper is made for removing tile and other flooring.